SAN MIGUEL DEL MONTE, Argentina (CNN) -- In a small farming town 105 kilometers (65 miles) southwest of Buenos Aires, farmers are struggling to nourish their crops and feed their animals. The worst drought in half a century has turned Argentina's once-fertile soil to dust and pushed the country into a state of emergency. Argentine farmers profited in years past from selling beef to the world, but some now struggle to feed their cattle. 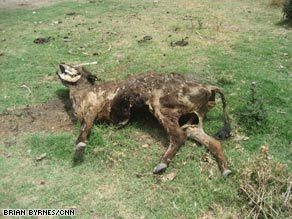 Cow carcasses litter the prairie fields and sun-scorched soy plants wither under the South American summer sun. Farmers are concerned about their livelihoods. "I'm losing money. I can't afford to lose money all the time," said Juan Cahen D'Anvers, whose family has been farming in Argentina since the late 1700s. He owns 700 hectares (1,730 acres) in San Miguel del Monte, where he grows sunflowers and barley. "Production is going to go down a minimum of 50 percent, maybe more. I don't know yet," he said. Argentina is one of the world's breadbaskets, providing commodities such as soy, wheat, corn and beef to countries around the globe. In recent years, record-high prices for these products reaped millions of dollars for Argentine farmers, but since the global economic crisis hit, demand and profits have dropped. Now the drought is making matters even worse. Cesar Gioia, another San Miguel del Monte farmer, said time is growing short. "If it doesn't rain in the next 10 days, I will have to wipe out my entire corn crop, 90 hectares (220 acres)," he said. "The best I can do with it is feed it to my cows." Facing pressure from farmers, Argentina President Cristina Fernandez de Kirchner announced emergency measures this week that will exempt the worst-hit farmers from paying most taxes for one year. "This is a big boost of patriotism, and a sign of support from all Argentines," Kirchner said on January 26. "All other sectors of the economy will continue to contribute, so we can help the farmers who have been affected by this drought." Kirchner has had a contentious relationship with farmers, who staged noisy protests and strikes last year over an increase in export taxes. Those taxes eventually were reduced, but farming leaders still contend that the government is out of touch with their needs. "Sure, this plan is approved now, and it helps, but we need money to feed cows, to go back to planting crops, because this drought is impacting life in every sector of society," said Eduardo Buzzi of the Argentine Agrarian Federation. As she yanks dead soy plant vines from a dusty field in San Miguel del Monte, Lorena del Rios of the Argentina Rural Society says she expects the drought to affect both Argentine and overseas consumers, especially when it comes to Argentina's world-famous beef. "We will see less meat available, which means rising prices," she said. "There is even the possibility that in a few years Argentina will have to import beef, which is almost unthinkable for people here."